Testimonials from truly satisfied customers. Thank you so so so much for all your help with my dress, the girls in the shop are fantastic and couldn't help enough I felt totally at ease. I then had to come back to the shop in a panic and loosing weight and needing my dress altered 3/4 sizes again there was no problem and my gown fitted perfectly and you would of never knew it was altered so much. I have been raving about Sarah Louise bridal to all the girls I know getting married, id love an excuse to come back. Thank you again girls. Hello, Just wanted to say a massive thank you to all in the shop. Our wedding day was amazing and I had lots of great comments on the dress! 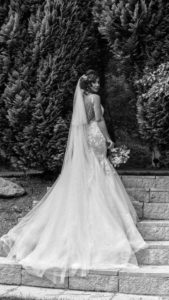 Just wanted to send you a few pictures of my wedding dress. I was so pleased with it and all the guests commented on how beautiful it was. Thank you for all your help. Hi, I would just like to say thank you very much to Annmarie for her help yesterday. Up until I came into your shop the thought of shopping for my dream wedding dress seemed like a very hard task and not enjoyable. 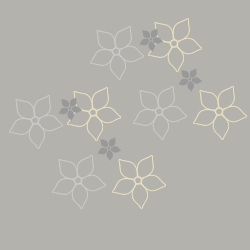 However, after being in your shop for 10 minutes this changed very quickly and this being all down to the excellent customer service and care I was given by Annmarie. She made me feel happy and content with no pushing me into anything! I am pretty sure I have found my dress in your shop so no doubt you will be getting another visit sometime soon and I look forward to this! Thank you once again and Im sure you will continue to make girls feel at ease just like you did with me!! I just wanted to say thank you so much for everyone's help with my dress, especially the lady who done my alterations ( I can't remember your name sorry!). We got married on 5 October 2013 and it was such a special day and my dress was perfect! Thanks again and I will definitely recommend you guys to all my friends when it's their big day! These are genuine letters and cards sent to the staff from truly satisfied customers who are delighted to share their experiences with future brides. The names of the customers are included for authenticity and these cards and letters are on display within the store and can be viewed at any time. Hi, just wanted to send a little thank you for helping me choose my dress and veil for my wedding day. It was absolutely perfect! I received such lovely service every time I came into the shop, will be recommending to everyone I know!! Hope you are all well? 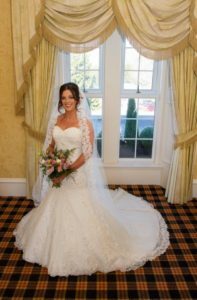 Now I have finally got my wedding pictures from the photographers I just wanted to send a quick email to thank you all for everything in helping me pick my Bridal Dress, veil and my Bridesmaids Dresses in your store for my wedding on 24th June, 2017. My experience in your shop was a delightful one. Your staff were all very helpful on each and every visit. Your store was the first shop I visited on my quest to find the dress of my dreams and as it turned out, the very first dress I tried on is the dress I chose as the one in the end. My fittings all went well and the seamstresses are all brilliant at what they do. My dress fitted like a glove and I felt amazing in it all day so much so I didn’t want to take it off. 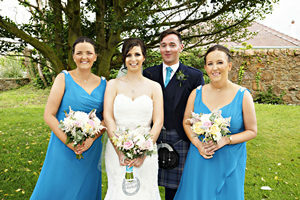 I have attached a few pictures of my beautiful dress and of the bridal party. Thanks Again Girls. I will definitely be recommending you store to any future brides I know. Hi - Thank you so much for all your help with my bride's dress. 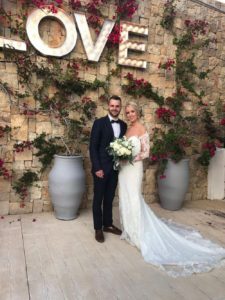 As we were getting married without anyone knowing it was a stressful time for me as I could not discuss my dress with anyone but your staff did everything that I asked for and helped with the stress levels. I have attached some photos from our wedding album and everyone who has now seen our photos have all said that my dress was absolutely stunning. That in itself is a credit to Sarah Louise Bridal. Once again thank you very much for everything. To everyone at Sarah Louise Bridal, especially my new mother in law Lorraine, I've struggled to find the words to thank you all properly. Our day wouldn't have been close to what it was without you all. The time and effort each of you put into our whole wedding party was incredible and we will be forever grateful! I have never felt so special in my whole life - my dress and veil was a dream come true. Can't believe how absolutely stunning the bridesmaids turned out after stressing we wouldn't find anything in such a short time. You guys are nothing short of amazing and I thank you all from the bottom of my heart for everything you have done. 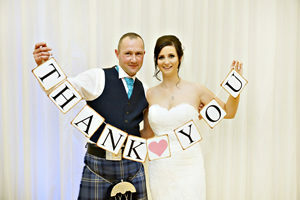 I loved my dress, thank you Sarah Louise Bridal"
Hello! 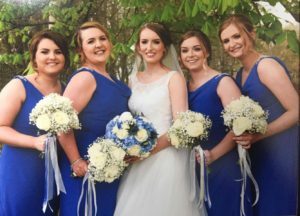 I just wanted to say Thank you so much for all your help along the way with my bridesmaids . 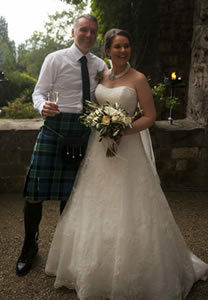 Morning Lorraine, thought you might like to see pics from our wedding on Saturday. All the dresses looked stunning and were complimented on throughout the day and now beyond. Hi, just wanted to send a little thank you for helping me choose my dress for my wedding day. It was absolutely perfect! Hello, just wanted to pop you a message to show you a picture of my dress I got from yourself . 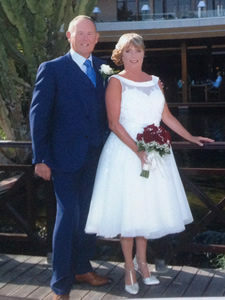 I got married on Wednesday in Ibiza and I had so many compliments on my dress and the staff at your shop were lovely and helped me choose the perfect dress. Lorraine and all the girls at Sarah Louise are fantastic and I cannot thank them enough nothing was any trouble for them. 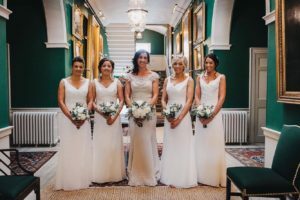 I got my wedding dress and my bridesmaids dresses from here and the only word people used to describe them on the day wasn't anything less than stunning! People are still talking about my dress!! Also everyone else has told me about picking up their dresses months before their weddings which is just crazy I collected all my dresses the day before all steamed and ready to go for the next day not having to worry about getting any creases out of it! Absolutely loved Sarah Louise Bridal! From my very first try on the girls were fantastic, such great service and every appointment I had was well organised and a great experience. I required quite a few alterations on my dress after losing weight and the dress still looked just as beautiful once the alterations were done (they were also very quick with these too). 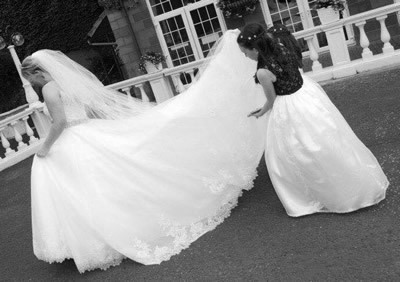 My wedding dress was gorgeous and everyone at my wedding commented on the day how beautiful it was. Thank you so much for helping me find my dream dress and making everything afterwards so easy. I just wanted to message and say a massive Thank You for all the help with my dress! You couldn't have been more helpful! 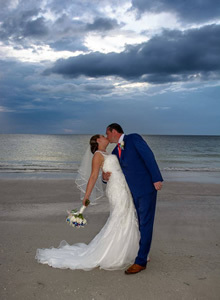 Just about to go leave a review on the main page just now but you all helped make both my Florida Wedding and Oran Mor wedding perfect!